Rev. 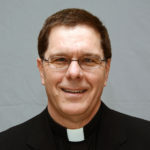 Karsten is the pastor at Holy Cross Lutheran Church in Moline, Illinois. Listen to a recording of “Though All Our Life is Like a Scroll,” featuring a new tune by composer Dr. Jeffrey Blersch. For He alone still saves us. So we would perish nevermore. His grace alone still clothes us. He nurtures us with Heaven’s food. True faith alone still anchors. Proclaims the dead and risen Lord! God’s Word alone: still truthful. To God who gives salvation. Let this be our vocation. For He alone is worthy. Two settings of this hymn are available for your church’s use. One setting features a familiar tune (think of “Salvation unto Us Has Come” LSB 555), and the other setting option debuts a new tune written by Dr. Jeffrey Blersch, Professor of Music at Concordia University, Nebraska. Each PDF includes accompaniment and reproducible pages for congregational singing.